1Laboratory of Natural Products, State University of Montes Claros, Avenida Dr. Ruy Braga, S/N - Vila Mauriceia, 39401-089, Montes Claros - MG, BRAZIL. 2Laboratory of Bioporpection and Genetic Resources, State University of Montes Claros, Avenida Dr. Ruy Braga, S/N - Vila Mauriceia, 39401-089, Montes Claros - MG, BRAZIL. Mauritia flexuosa and Mauritiella armata belong to the family Arecaceae and are widely found in Brazil. Aim: In this work were evaluated: the phytochemical profile of the secretion popularly known as M. flexuosa wine, antioxidant activity of leaf, root and petiole hydroethanolic extracts of the two species, as well as the quantification of flavonoids and the chromatographic profile by means of high performance liquid chromatography. Material and Methods: The chromatographic profile was determined by high performance liquid chromatography, quantification of flavonoids and antioxidant activity, were performed by spectrophotometric method. Results: Antioxidant activity and presence of flavonoids were observed in the extracts of all the analyzed structures of the two species. The phytochemical profile of the wine evidenced the presence of secondary metabolites reported in other structures of M. flexuosa. In the chromatographic analysis, it was observed that the extracts evaluated have between three and nine compounds. Conclusion: Further studies should be performed to identify the active compounds in the two species. Royo Vd, Rocha JA, Santos KT, Freitas JF, Almeida CA, Ribeiro B, et al. 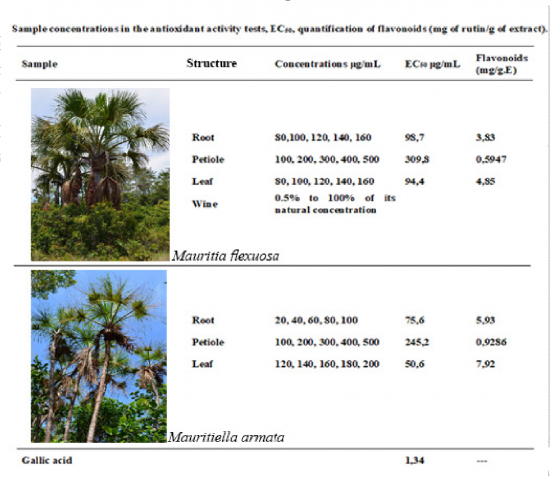 Comparative Studies Between Mauritia flexuosa and Mauritiella armata. Pharmacognosy Journal. 2019;11(1):32-36.